the vibe of the location is great - right on the canal in the business district in Ghent- but since it was December only indoor seating which was limited as the inside isn't very big. the bar area is decorated in dusty bottles and other old beer items. bartender was a bit gruff and wanted payment upon bringing our round of beers - I guess they don't do tabs? Anyway, the draft and bottle list was pretty good. the food menu was sparse, we didn't partake. A sentimental favorite in Ghent. Love the vibe and the great service. Nice place. Inside is a small, classic bar, or you can sit outside with the canal in view. Good selection of Belgian beers, not surprisingly. Cantillon Kriek 750ml was out of stock, but I opted for a 375 of that side by side with a Drie Font Kriek (the latter always my favorite of the two anyway), to share with the wife. I'm pretty sure one of the buildings in that little square is an actual restaurant, but at this bar, food was basically meat and cheese plates, and they were actually good, and quite filling at a decent price of less than 10e. Service was a little awkward. We wandered around the outside area while the server stared at us from the bar, until finally we gave up and asked if we could sit outside. She spoke English, but still looked at me like I had ten heads. But overall, not too bad. There were only two other people there, but I'd imagine this place being a bit crazy during busy hours. It was fun, and I'd recommend it, just don't expect good service. 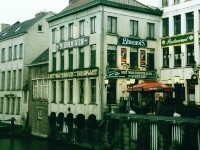 The bar in Ghent with the largest variety of beers. Directly located in the center of the city, this place is always very crowded, no matter if its in the middle of the day or at nighttime. Has a cozy atmosphere, not too much room, it got two levels, the second one was more pleasant, because of the nice view. They sell many different beers, including three home-made brews, which are very recommendable. Also you can buy tasty cheese with mustard, which goes very well with most of their beers. The odd thing about this place was a houserule which doesn’t make any sense to me. We revisted on the day we were leaving, to buy a bottle of Gandavum, their housebeer, but weren’t able to get it, because they only sell it from 4 p.m. in the afternoon. Seeing all those people around that space already drinking their beer, that rule seemed kind of unreasonable. Working in the Altbiertown Duesseldorf I made the opposite experience, breweries sell their beer only till the early evening, because then, their taproom gets too crowded, and they don’t want the botteled beer to interfere with the ones on tap. That actually made sense to me. A large canal-side restaurant and pub with an incredible array of great beer selections. We ended up sitting outside on the patio overlooking the canal. I ordered a Hercule Stout--a roasty but mild stout with some Belgian yeast character. After sharing sips of our various beers, with my wife swigging Cantillon out of the bottle like a heathen, we really enjoyed our trip here! Dinner later that same night was in the attached Chez Liontine, which luckily had the same impressive beer list as at the outdoor pub. We were seated in a warm and crowded upstairs dining room. I ended up ordering a Flemish stew with pig cheeks, braised in Trappist ale. It was fantastically flavored and the pork was beyond tender, and went amazingly well with a Rochefort 10. We then had a Kriek-Off between a few of us, comparing several of the local cherry sours. One of us had the Beersel Kriek--I gave it a 3/5 because it was back sweetened too much. My wife had the Girardin Kriek--I gave it a 4, but it had a little skunky aroma I didn't love. And I won this round with the Hanssens Oude Kriek rated at 4.5--almost no carbonation, but so tart and puckering! Great place to just sit down and have a drink next to the canal. Amazing selection of beers, I think it is over 180! They have almost every single glass for every single drink they have. Great place to go! The staff are great and really helpful about what beer is what. Carry over proper glassware, cool serving of the beer, 16 draft selections (ex. Boon, Augustijn, Gulden Draak, Piraat, Klokke) plus 150 bottles (ex. De Dolle, Tilquin, Val Duei, Floreffe) at reasonable prices and you have yet another good Belgian beer bar. It did have one flaw during my visit though, the service is rather slow. It took many minutes before I was approached by a waitress to make my beer selection. If you can tolerate that, this would be a good place in Ghent to stop at for a beer.